Hydrocarbons, in the environmentally friendly group have drawn much attention of scientists and researchers for application as refrigerants. In this work, the performance of two eco-friendly hydrocarbon refrigerants (R510A and R600a) in a retrofitted vapour compression refrigeration system was investigated experimentally and compared with the baseline hydro fluorocarbon refrigerant (R134a). Thermocouples and pressure gauges were fitted at the inlet and outlet of the compressor, condenser, and evaporator to measure the temperature and pressure of the refrigerant at various stages of the refrigeration cycle. The results obtained showed that the coefficient of performance (COP) of the system using the two hydrocarbon refrigerants was higher than the coefficient of performance (COP) obtained using R134a as a working fluid. Generally, the two hydrocarbon refrigerants performed better than R134a, but R510A gave the best overall performance in that it exhibited the lowest discharge pressure of 0.656MN/m2and the highest refrigerating effect of 253.29kJ/kg. R. Kumar and R. Shekhar, “Performance analysis of vapour compression refrigeration system by using Azeotrops,” International Journal for Scientific Research & Development, vol. 3, no. 4, pp. 255-267, 2015. F. Bill, and L. Duncan. “Chlorofluorocarbons (CFCs),” The Gale Encyclopedia of Science, http://link.galegroup.com/apps/doc/CV2644030480/SCIC?u=albertak12&xid=c35ecbf6, February 2018. B. O. Bolaji, A. O. Akintaro, O. J. Alamu, and T. M. A. Olayanju, “Design and performance evaluation of a cooler refrigerating system working with ozone friendly refrigerant,” The Open Thermodynamics Journal, vol. 6, no. 1, pp. 25-32, 2012. A. 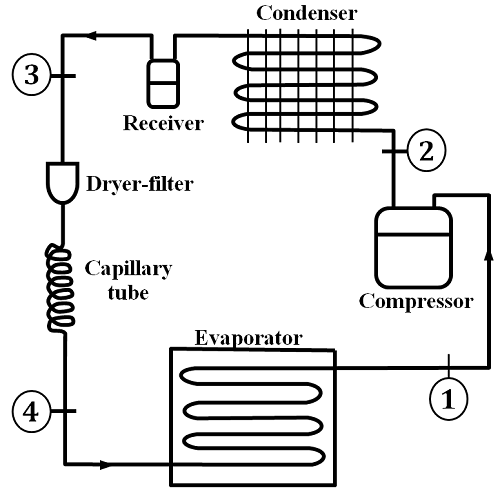 B. Agrawal and V. Shrivastana, “ Retrofitting of vapour compression refrigeration trainer by an eco-friendly refrigerant,” Indian Journal of Science and Technology, vol. 3, no. 4, pp. 455-458, April 2010. Y. Kim, K. S. Chang, and H. Kim, “Thermodynamic performance analysis of vapour compression system using alternative refrigerants based on a cycle simulation program,” Journal of Industrial Engineering Chemicals. vol. 13, no. 5, pp. 674-686, 2007. J. Fernandez-Seara, F. J. Uhia, R. Diz, and J. A. Dopazo, “Vapour condensation of R22 retrofit substitutes, R417A, R422A and R422D on CuNi turbo C tubes,” International Journal of Refrigeration, vol. 33, no. 1, pp. 148-157, 2010. B. O. Bolaji, M. A. Akintunde, and T. O. Falade, “Comparative analysis of performance of Three-Ozone friends HFC refrigerants in a vapour compressor refrigerator,” Journal of Sustainable Energy and Environment, vol. 2, pp. 61-64, 2011. D. Del Col, M. Azzolin, S. Bortolin, and C. Zilio, “Two phase pressure drop and condensation heat transfer of R32/R1234ze (E) non-azeotropic mixtures inside a single microchannel,” Science and Technology for the Built Environment, vol. 21, no. 5, pp. 595-606, June 2015. B. O. Bolaji and Z. Huan, “Thermodynamic analysis of hydrocarbon refrigerants in a sub-cooling refrigeration system,” Journal of Engineering Research, vol. 1, no. 1, pp. 317-3333, June 2013. Bitzer, Refrigerant Report, Bitzer International, www.bitzer.de, February 2018. E. W. Lemmon, M. O. Mclinden, and M. L. Huber, “NIST reference fluids thermodynamic and transport properties REFPROP 7.0,” National Institute of Standards and Technology Standard Reference Database, vol. 7, 2002.